I attended a class last year which compared the items in your office to artifacts. What we keep around us is important. It was a great class, very interesting twist looking at things from a different perspective. The last few days have been scattered to say the least. Between the ice storm and close-everything-in-sight days, new schedules and increasing projects – it has been really quite frazzled around here. Today, after one of my meetings was cancelled I sat back down at my desk, popped in my earphones and looked at my desk. I believe it is the first time that I have looked at my desk in a week without diving right into work. Holy cow – what a disaster! This of course lead me to look at my credenza – oh no, the insanity continues! Papers to be filed, notes written but not attended to, receipts, printouts, notebooks, binders, journals, cds, manicure supplies (yes, I like to keep my nails manicured), business cards to act on…it is all, well noise. And although I have my nice soothing meditative music playing on my iPod right now, I am drowning in noise. And it is preventing me from being able to fully concentrate on what I want and need to get done. Are your surroundings keeping you from concentrating or moving forward on what you want? 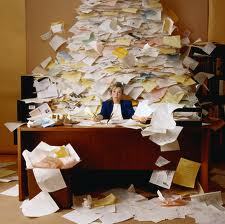 If your office or desk is still cluttered with anything from your past position then you are holding yourself back. Think of it this way: it is easy when you breakup with someone to clear all their noise from your life, give back their stuff, sell it, burn it – whatever, remove pictures, erase them by cleaning out any area that they effected. Very therapeutic and helps mentally and physically clear the way for better things to come for you. Stop stressing over a day!